Art Matters: WTF Am I Looking At? — Anna Akbari, Ph.D.
Art Matters: WTF Am I Looking At? Back in the 1950s, the big complaint people had with Abstract Expressionism was that it had no content. People were so used to seeing objects in paintings, they didn’t know how to approach one that had no narrative and no point of emphasis. It seems like a similar parallel can be drawn to contemporary art, only instead of having no content, the challenge faced by the viewer is a lack of context. How are you supposed to interpret what you’re seeing when, for example, you find yourself confronted by a sheep on a pedestal surrounded by colorful arrows? First step - resist the urge to yell WTF?! because I promise there is context to be found. It may sound sort of obvious, but the easiest thing to do is to Google the artist and look for interviews. Another option: attend a gallery walkthrough where the artist discusses the work in person. This is exactly what I did the other day with Los Angeles based artist Macha Suzuki. Viewing Suzuki’s work is like visiting a museum of personal history. We are led through memories of childhood, through the struggles of career, and into the changing nature of identity as we age. Suzuki turns the stories of his life into metaphor and symbol, and then meticulously crafts them out of ordinary things like cheerleading pom poms, tin foil, wood, chicken wire and paper. The conflation of high-minded ideas with a lo-fi aesthetic completely works to convey the truth of his narrative. Permission to Fail is a different way of looking at failure. Its pink letters are cheerful; the green poplar leaves (a symbol of rebirth) brim with life. The word fail looks more like a celebration than a pejorative, and for Suzuki it is. Every failure leads to a new beginning. A relationship ends, but another one begins. 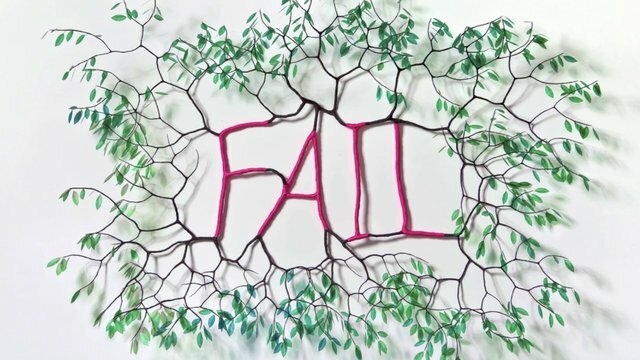 A project doesn’t work out, but within that project are the seeds of knowledge that you can use next time to either succeed or, as Beckett said, fail better. Minor Threat gives us a glorious shiny sheep surrounded by colorful arrows (suspended from nearly invisible wires attached to the ceiling). 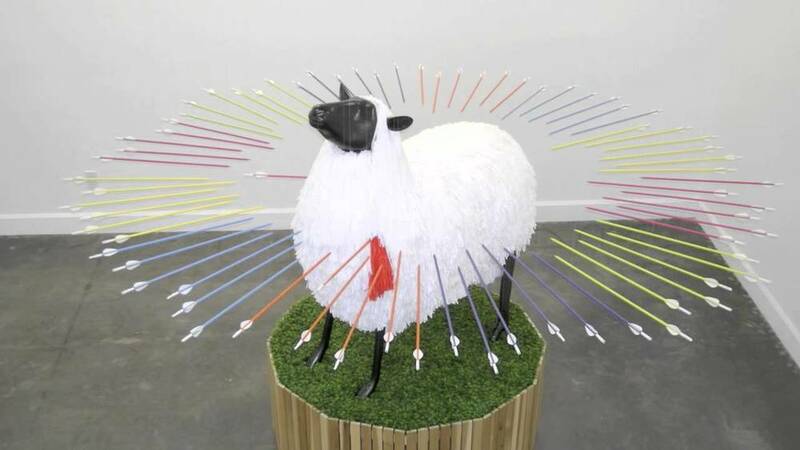 The proud sheep has already been pierced by one arrow, but shows no signs of the damage. In fact, the area on its chest has taken on the color of the arrow. We’re witnessing the brief second before all the rest of those brightly colored arrows hit – before life sends what life inevitably sends. But there’s hope in this moment. The sheep holds its head up high, ready for what’s coming, which is certainly not death, but rather, transformation. We won’t witness that moment, but we can fill in the blanks and imagine how the sheep will transform into a majestic technicolor wooly wonder. More beautiful for having endured. 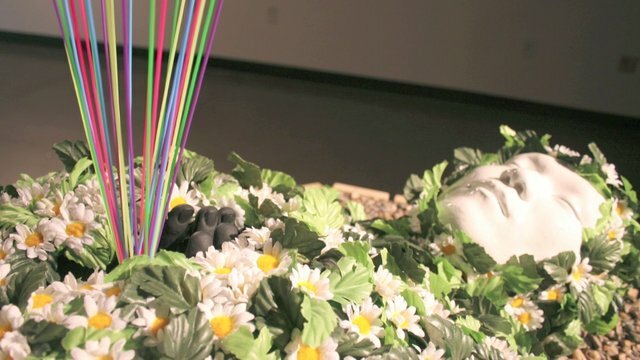 Death and Rebirth gives us a somewhat premature death mask (of the artist) covered in flowers. A clutch of ribbons seems to be pulling the body up towards heaven. It’s only when we look closer that we see another body inside – pushing it’s way out! Suzuki made the piece to celebrate the new self that emerged after his marriage. It represents a sort of joyful mourning of who he was (i.e. fun-loving single guy), and a playful excitement of what he would become (responsible husband and father). Suzuki gives us a visual frame of reference in which we can place ourselves. Think about how different you are from your teenage self, or what you were like before you had a job and responsibilities. He gives us permission to celebrate the stages of our lives without renouncing all that came before. Suzuki’s work reminds us that our lives are shaped by the ebb and flow of who we are now and who we will become. He reminds us that there are no ends, only new beginnings, and that there is something to celebrate in every failure. And so we come full circle: We enter wondering what the sheep surrounded by arrows means and leave transformed by the realization that the sheep is us! It just takes a little context. 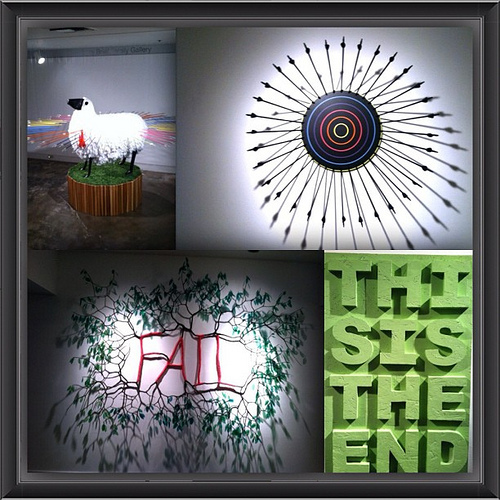 To see more of Macha Suzuki’s work check out his exhibit This is the End at the Vincent Price museum. To explore other upcoming contemporary artists check out Modern Edition.